Led by the surge of BitCoin, cryptocurrency seems to be all over the news lately. It's no surprise, then, that those hoping to cash in on the trend (no pun intended) are also filing cryptocurrency-related trademark applications. One of the latest trademark applications, filed with the U.S. Patent and Trademark Office on November 15th by a "Mr. Kofi" in Malibu, California, is for the design of the "Boomcoin" seen below. 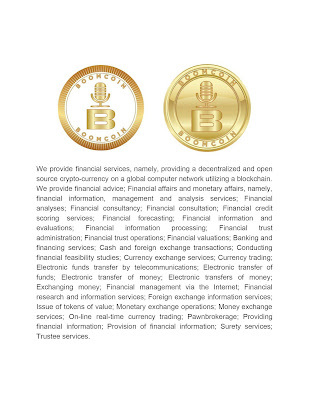 The application describes the trademark as consisting "of the wording BOOMCOIN in rose gold and gold. A depiction of two coins and a microphone sits on top of the B in the middle of each coin. One coin consist of two colors, rose gold and white in the middle. The other coin is solid gold." We provide financial services, namely, providing a decentralized and open source crypto-currency on a global computer network utilizing a blockchain. We provide financial advice; Financial affairs and monetary affairs, namely, financial information, management and analysis services; Financial analyses; Financial consultancy; Financial consultation; Financial credit scoring services; Financial forecasting; Financial information and evaluations; Financial information processing; Financial trust administration; Financial trust operations; Financial valuations; Banking and financing services; Cash and foreign exchange transactions; Conducting financial feasibility studies; Currency exchange services; Currency trading; Electronic funds transfer by telecommunications; Electronic transfer of funds; Electronic transfer of money; Electronic transfers of money; Exchanging money; Financial management via the Internet; Financial research and information services; Foreign exchange information services; Issue of tokens of value; Monetary exchange operations; Money exchange services; On-line real-time currency trading; Pawnbrokerage; Providing financial information; Provision of financial information; Surety services; Trustee services. Note that the USPTO may require the applicant to clean up this description of services, particularly those at the beginning. TMEP 1402.01 states "[t]he identification of goods and/or services must be specific, definite, clear, accurate, and concise." Extraneous wording like "we provide" should be omitted. According to the application, Mr. Kofi has been providing the listed services under this mark at least as early as January 1, 2013. However, the specimen submitted with the application, seen below, does not appear to show the mark as it is used in conjunction with the advertising or rendering of the listed services. Acceptable specimens of use for services marks are those "(1) showing the mark used or displayed as a service mark in the sale of the services, which includes use in the course of rendering or performing the services, or (2) showing the mark used or displayed in advertising the services, which encompasses marketing and promotional materials." TMEP 1301.04. Those specimens may include "newspaper and magazine advertisements, brochures, billboards, handbills, direct-mail leaflets, menus (for restaurants), press releases that are publicly available (e.g., on the applicant’s website), and the like." Id. According to my quick search, approximately 378 cryptocurrency-related applications have been filed with the USPTO and about 315 are currently active.